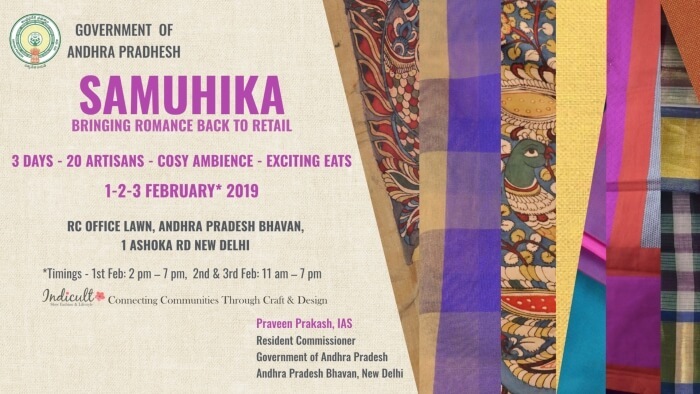 Event Description : Government of Andhra Pradesh & Indicult present "Samuhika"
Samuhika, a textile led event being held on 1-2-3 February 2019, is the coming together of crafts, craftspeople and craft lovers. The diversity of Andhra Pradesh's rich textile traditions will be showcased through district level weaver societies. Exquisite Uppada, enchanting Mangalgiri, Venkatagiri, and Kalamkari, along with weaves in Malkha and Khadi are being curated by Indicult for a great weekend buying experience. This will be complemented by beautiful textiles from the rest of India - Banaras, Kutch, Bhagalpur & Chhattisgarh. Through this event, Andhra Pradesh Government wishes to foreground not only the products but also the producers and consumers of indigenous hand made and hand woven creations. Indicult is partnering to connect communities through craft & design keeping in mind the urban Indian aesthetic. Come experience the charm of slow fashion as we bring romance back to retail. About Indicult : Indicult is a Slow Fashion & Lifestyle brand that aims to create spaces to connect communities through Crafts and Design. The name "Indicult" connotes Indic rooted crafts as the ultimate in terms of the story each product carries in its being. Its founders Sharika Meenu Gouran plan to offer interesting and different experiences.& Samuhika, which means a 'collective' is their first such collaboration.